I’ve replaced him with Aguero. As I write this according to the excellent price change site FPL statistics Kane is 52% on the way to a drop and Aguero 91% on to a rise. I would be surrised if Aguero des go up but no point in taking a chance so I’ve made the transfer. It now means I’ve got £2.5m in the bank and I’m not really sure how I’m going to use it. Anyway that’s a task for tomorrow. Depending on how you’re playing it.. I can’t see Sterling starting against Palace while Sane should be a lock to start that game. Top of my mini has Aguero and Mane, so I need a differential strategy. I have same team as you Geek but laca for Aguero, Dunk instead of TAA. Camarasa for Sterling for dgw35, then Dunk to Robertson for gw36 to captain him. What’s your team before and after WC value Geek? Out if interest what’s the idea behind the double Southampton bench? As I assume the plan is to BB after this gameweek but if you’re not even rising playing any of them against Wolves at home surely the BB against Newcastle away is a pointless? 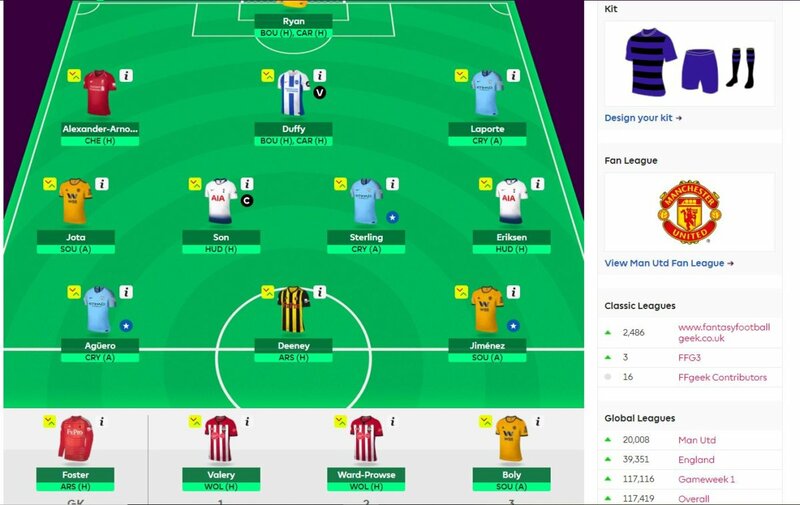 WC Activated: I’ve gone with Murray for this double gameweek to bring in Deeney for GW35? Not many opting for Murray – do many think he will have gametime risk? Also punt on Ramsey – showing form – good differential? DGW in 35 but not featuring in many posted teams? @Badhoon – Ramsey played full 90 min recently probably due to the fact that Torreira was suspended and Xhaka injured. Will he play full 90 every game now? Not so sure. Plus Arsenal has 4/6 away games and with their away form it is really risky.